These days, you want to create a LinkedIn profile that will get praise on the web. A profile that will get recruiters to dial your number… a profile that will clog your profile with thousands of InMail messages. Indeed, having a presence on LinkedIn can increase your odds of being recruited. The platform rose to 300 million members last year, amongst which are individual recruiters and enterprises looking to hire the right fit for their corporations. It’s also intriguing that89 percent of employers have recruited from the site, so it’s a great opportunity to seek professional roles. If you hope to be on someone’s radar, you’ll have to optimize your presence. The platform offers many overlooked ways to be more discoverable in search results and promote your expertise. There’s a space of 2,000 characters to fill up for the summary, so you have the opportunity to list your goals, broader expertise, and success stories. You could also include real-life examples to demonstrate your experience. If you are a graphic designer, you can include a digital clip. If you are an author, you can include a chapter of your publication. Start-ups, sales, marketing, social media – the right keywords can be incredibly effective. 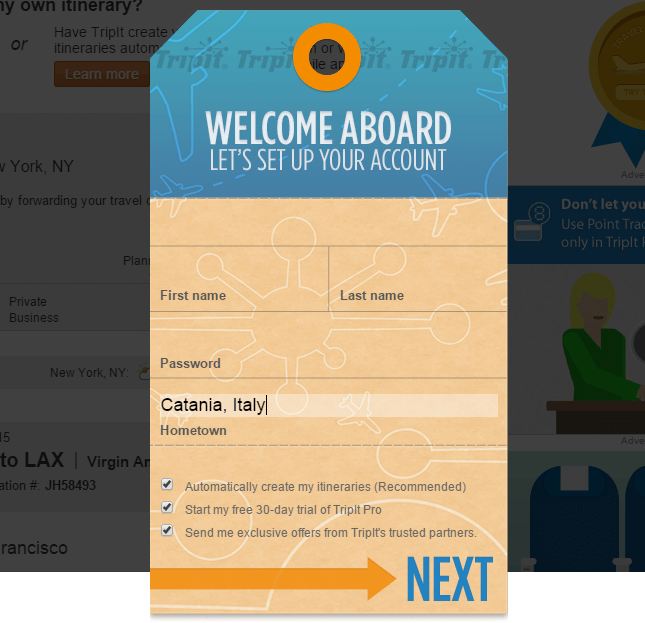 Demonstrate your experience by including presentations, web addresses, etc. Headline gives you an opportunity to highlight your experience, so it needs to have something specific than the title of your current profession. LinkedIn will fill this space if you don’t optimize this element by filling the headline with the title of your recent or current role. You should also note that the professional headline will show up under your name in search engine results. It can be a selling point, so you need to use a variety of terms to show up in a variety of searches. For example, using ‘Graphic Design professional’ as well as ‘Web Design specialist at abc’ will increase your chances of being discovered by recruiters in the same industry. I recommend using the divider symbol (|) to separate titles when listing several expertise in the headline. Also, you should avoid any words like ‘experienced’ as mentioning such words is weak telling. As the profile picture is crucial for your personal brand, you can take the option of hiring a professional photographer. Discover relevant groups by using industry-specific keywords or via the group memberships your connections have. When you join a group, contribute professionally by sharing your views on a particular topic and start ongoing discussions. And if you’re the founder of a group, you might as well be an active member of it. You might not know that when you’re a member of the same group as someone else you want to get in touch with, you can message them without the need of being their first-degree connection. Group members are also able to see profiles of fellow members without being connected, so joining more groups will expand your profile visibility and messaging options. Give them a try, and see how joining a group can add a boost to your optimization goals. Wouldn’t you like people to see you as a thought leader as you optimize your profile? LinkedIn’s publishing platform will deliver your content to a network of people seeking professional insight. You can use a tool like BuzzSumo to come up with interesting topics relevant to your profession. A published post can be viewed by anyone on LinkedIn; think of the platform as a way to showcase your expertise with high-quality information. The added benefit is that LinkedIn articles are ranking well in Google search results. 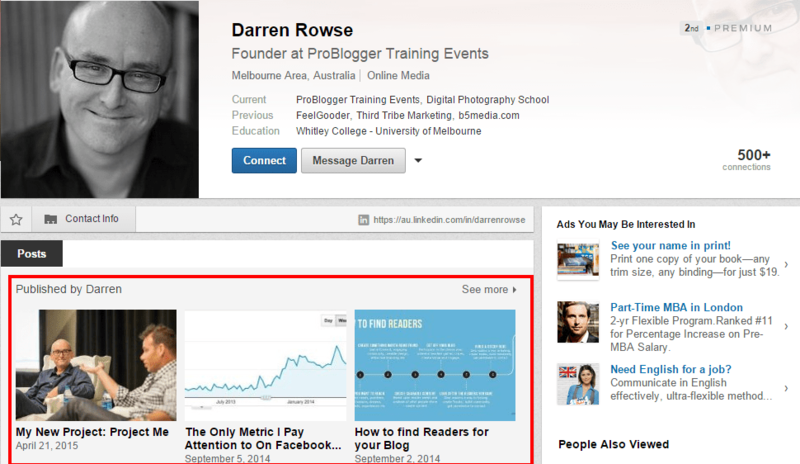 Published posts are added to your profile, and anyone viewing your profile can see your publications. Even analytics showcasing the number of views, likes and comments are displayed. If your contribution gets featured on a LinkedIn channel (read about Channels here), you’ll get added exposure. You need to add skills to your profile for optimization and get endorsements for those skills from your connections. LinkedIn will display your top 10 skills based on the number of endorsements, which will help profile viewers know what you excel in. The skills will be displayed in the drop-down menu, and skills that have been endorsed will move to the top. Endorsing others also helps build strong connections with people in your circle. Usually after endorsing someone, you receive an endorsement and it’s easier to talk to the connection because you’ve been in touch recently. It’s possible to rearrange, edit and remove the skills and corresponding endorsements as well. Only recommendations approved by you will be displayed on your profile. In your profile, you get the option to add your certifications, honors & awards, volunteering experience, publications, projects, and test scores. These credentials will add value to your profile: if you don’t have a job, your volunteering experience will show you have been a part of an organization. If you have a certification that will make you stand out in the competition, display it here. Show prospects what you’ve achieved so far in your life. You can include a lot of details in each of these sections. For example, publications let you include the URL of the book or website, the excerpt and the title. LinkedIn allows you to add up to 2,000 characters of description to a publication, as well as names of people (if any) associated with the publication. Likewise, you can list larger initiatives you’ve been a part of in the Projects section. You don’t have to stick to collaborative efforts though; you can too reference your own internal work. While you can list as many publications and projects as you have available, I don’t see it as a necessity. Instead, list the achievements you really want prospective employers to recognize you for. The profile will include your personal name. My recommendation is to keep the vanity URL same for all your social networks, something like ‘facebook.com/danvirgillito’ and ‘linkedin.com/in/danvirgillito’. 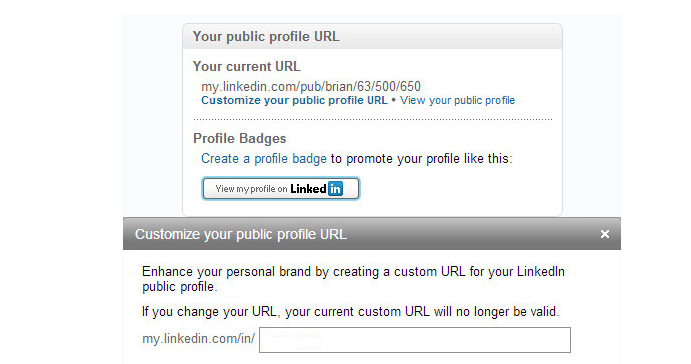 LinkedIn users can also use profile badges to promote their profile on personal websites, guest blogs, etc. When users click on those badges, they’ll be redirected to your profile through the vanity URL. Your status updates will be seen by anyone who views your profile, and these updates will appear in the LinkedIn feed of your connections. Status updates are also included in the email you receive from LinkedIn as the weekly network update. Your latest status update will appear on your profile page. The character limit was changed from 140 characters to long-form for the status. In the ‘your updates’ tab, you can see the summary of all your updates. With the above-mentioned tabs, you’ll be able to spot any update that was left as a draft and schedule it for later. We think highly of people with good company, so increasing your network connections builds your personal brand on LinkedIn. Connect with former classmates, friends, industry leaders, trusted partners and other professionals. If you want an introduction to someone, ask your connections (1st degree, 2nd degree, etc.) to introduce you as a contact. Profiles with strong and relevant connections (your connections reflect your personality) are always growing. 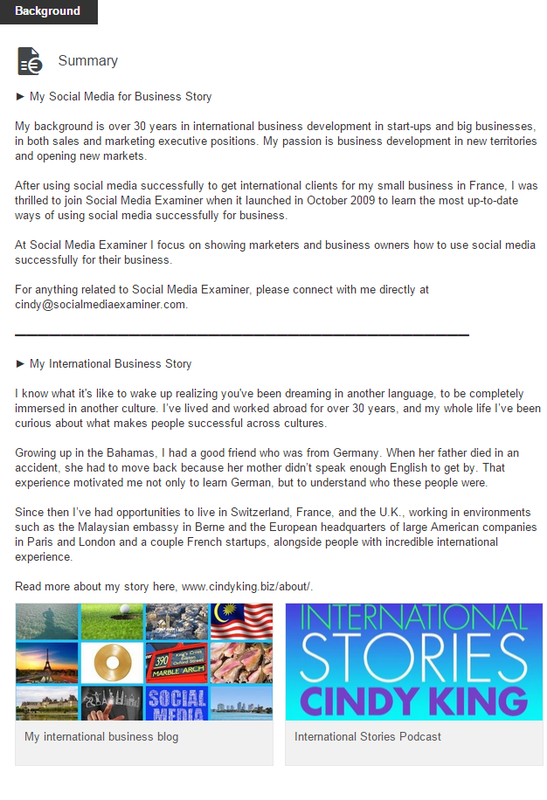 Another way you can incorporate branding is by customizing your LinkedIn background image. This requires you to upload a custom 1400×425 pixel image. Background is the first thing visitors notice on your profile, along with the profile image, so it is a sign of trust and credibility. 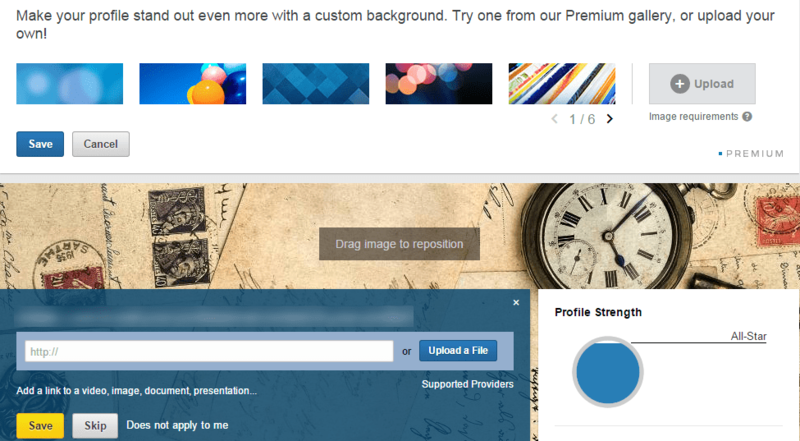 For premium members, it’s possible to choose a default background offered by LinkedIn, but it’s always a better option to upload a custom image. LinkedIn wants you to use a GIF, PNG or JPG image with 4MB being the maximum size. Choose the option that suits your budget. Note: When deciding what to use as a background image, keep it simple. If your success can be demonstrated with numbers, add them. If you have known clients, add their logos. Finally, offering help is crucial. Give out recommendations, congratulate people on their work anniversaries and volunteer your expertise. When people know you can be relied upon, you create a memorable experience, which builds trust and gives you additional recommendations.